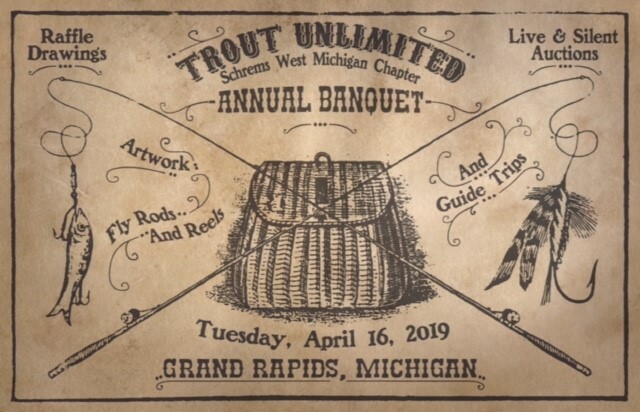 The 2019 annual fundraising banquet will be a wonderful evening of celebration, fellowship and recognition of area fishery enthusiasts. Since 2010, SWMTU has invested $1.1 million in cold water fisheries and habitat, education, and member events. Our banquet is a large part of our fundraising effort. There will be an auction and raffle items including: fly rod & reel packages, artwork including original works by Dave Vanden Bos and Drew Rosema, singed/numbered pieces by Art Neumann, George Griffith, David Ruimveld, and Bud Kanouse, guided fishing trips, Ron Barch bamboo fly rods, Sam Lacina custom-made landing net, and much, much more. 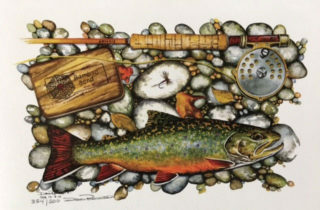 Door prize drawings will be a half-day float with True North Trout, a float with John Schmidt “The Trout Bum”, and an Orvis Endeavor Fly Rod package. Individual Sponsors will get this framed print by David Ruimveld. Please reserve your spot as soon as you can, early registration greatly helps with the planning process. This ticketing system will close at 5pm on April 11. If you want to pay at the door, please email Tom Mundt by Sunday, April 14 so he can reserve you a spot and print a name tag. Our primary means of accepting reservations is via the ticketing system near the bottom of this page. It is a quick and convenient way to make your reservation. The system uses PayPal to conduct the transaction, but you do NOT need to have a PayPal account. You can use any valid credit card. If you run into problems with the ticket system, please contact us. If you prefer to mail a check, please include the information below and mail it to SWMTU, PO Box 230094, Grand Rapids, MI 49523.